As a busy mom of four, I find myself always on the hunt for organization tips and methods for simplifying our (sometimes) hectic family life. I think a lot of moms are in the same boat, which is why the concept of minimalism is so popular. While definitions vary, minimalism is basically the concept of owning less stuff, having less clutter and enjoying simpler schedules and lifestyles. Enjoying what you have, wanting less and being more content with the non-material things in our lives. For me, it’s living – and parenting – with intention and purpose and reducing distractions that keep us from these purposes. I have been in a minimalist mindset for a long time but didn’t know there was a name for it until recent years! Admittedly, I have a looooong way to go to become a “true” minimalist, even though we just cleaned out five bags of toys from our home this month (happy dance)! 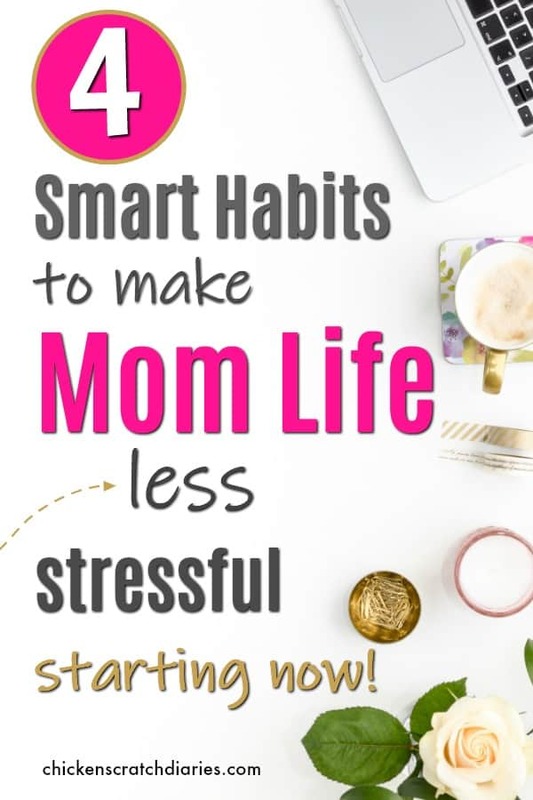 But if we want to live more freely and enjoy the fleeting moments we have with our families, I think we also need to look at our everyday routines and habits. It can be easy to assume that chaos in motherhood is just a given, something we have to accept. However, the more kids I have, the more I’m learning to discern what’s at the root of the busyness and decide what changes I need to make to enjoy my family more and create the life I really want for myself- and my family. What can we, as moms, do in our daily lives to make the most of our family time? How can we reduce distractions and spend less time worrying about “all the things” that have to be done each week? Below are four tips which I believe can make a huge difference. If I were to take a survey on what stresses moms the most, I would bet that figuring out what to make for dinner (and every other meal) would top the list! This is why it’s imperative to have a meal plan at the beginning of each week. You may think you don’t have time to meal plan. Here’s the truth: you don’t have time not to meal plan. The 30 minutes you spend creating a weekly menu and grocery list will save you TONS of stress each week, as well as time, if you’re currently figuring out dinner on-the-fly every night. And if you’re stopping for takeout too often during the week, you’re probably stressed that you’re not eating healthy and you’re spending too much money- which is also correct! Set aside a time each week that’s dedicated to meal planning – Friday nights after the kids go to bed or whatever evening before the day you plan to go grocery shopping. Try to find a time during the day where you can really concentrate on making a solid plan for the week. My Completely Basic Guide to Meal Planning will guide you step by step in this process. If you’ve never done this before, you will be so surprised how much meal planning will help your sanity! If you want to take it a step further, check out this post about crockpot freezer meals. Freezer cooking involves prepping several meals at once (you can make 8 in an hour), freezing and later cooking in a slow cooker on days when you REALLY need an easy button. • Breakfast tip: Keep it simple. Write your breakfast menu at the bottom of your Menu Master List (I describe this in my Meal Planning guide also), and keep it in a spot in your kitchen where your kids can see it. This is mainly for my older kids, but this allows them to quickly grab/make whatever we actually have available in the morning so that I can focus on other tasks instead of telling them what we have or giving them ideas on what to make. I have raised very independent breakfast-makers thus far! And, it saves us a lot of time on busy school days. Do you ever wonder why people who like to organize are so giddy about it? Yes, I’m sure it’s partly a personality trait (recovering Type-A here, all the way), but there’s also this strange sense of calm that comes with being organized. 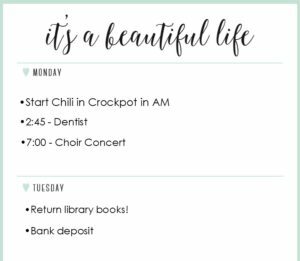 When your weekly schedule has at least a semblance of order, it makes for a less hectic mom, which benefits everyone in the family. What do I use mine for? Appointments, Random Reminders, and Bills. When you’re making your meal plan for the week (you’re going to do that right?! ), sit down and also go over your schedule for the week. This means pulling up those random reminders in your Google calendar you’ve stored on your phone and pulling out those appointment cards from your wallet. I firmly believe that having all this info in one place, in writing, makes my life much easier. I like the planners that have a daily block of free space to write whatever I want as well as a monthly calendar at the beginning of each month. On the daily blocks, I list my appointments that fall in that week, or random notes like “call insurance agent and ask about a lower rate on car insurance” – stuff like that. Once you get the meal planning down, you can even write what meals you plan to make each day and/or any prep needed (“Thaw out roast in fridge tonight”). I also do my best to remember to go over the kids’ school calendar each week and plug in any after school activities, practices, school plays, concerts, etc. This doesn’t always happen but it really helps when I’m not surprised by conflicting activities! 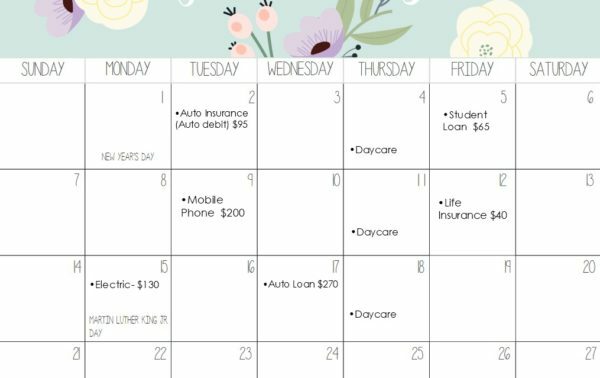 On the monthly calendar portion of my planner, I write down all of my bills that are due on each due date and the amount. Keep your planner in a dedicated spot where you’ll see it and refer to it each day. Mine stays in my office next to my laptop. If you need some inspiration, the Erin Condren Planners are very popular, and I’ve also been eyeing this cute Happy Planner (both shown below). Another option that’s on my wish-list currently: A large (2 ft by 3 foot!) dry erase wall calendar where EVERYONE in the family can see what’s happening and when. If digital organization is really more your thing but, like me, you get annoyed with typing everything into your phone on a tiny keyboard – check out Trello. With Trello, you can create lists and boards for specific goals you want to accomplish and you can also view them in “calendar” view- all from one location. You can even share these lists with, for instance, your husband so that you can track your goals together. The best part is it’s free and there’s also an app you can download on your phone. Trello could completely replace your need for a paper planner if digital notes are more your style. Tip #3: Prepare for the next day each evening. After kids have gone to bed, this is the best time for me to plan for the next morning. For the days I’m going to be at the office, I set out the diaper bag, my purse and my work bag all on the kitchen table where I can grab it on my way out the door. I restock the diaper bag and make sure all my notebooks and needed items are accounted for. I also lay out my two youngest kids’ outfits for the next day on the kitchen table since that’s where we seem to all congregate in the morning. If you pack school lunches, this is also a good time to put all the non-perishable items in the lunchboxes and make sandwiches/package the cold items in the fridge to grab & go the next day. As a bonus to all this night time planning, I find that I’m somehow more motivated to get up and not hit the snooze button in the morning if I know that I have less decisions to make in the morning! And here’s another secret hack I’ve taken advantage of recently: If you need extra help getting organized step-by-step, Hillary at Pulling Curls offers a FREE course called the 5 Word Organization Challenge. One of the easiest ways you can simplify your life these days is to limit social media usage. I’m not suggesting to give it up completely – just schedule your time on it, so that you use it wisely. One idea is to pick times during the day that you allow yourself to use social media and only use them during those specified times. This could be set times during the day (10 AM and 10 PM for example) or specific periods during the day (during lunch break or nap time, or when kids are in bed). You can read about what my short tech-break taught me, but I can guarantee you will feel less stressed and more productive if you are disciplined with your time spent on social media. It’s way.too.easy. to get sucked down the Facebook/Instagram/Pinterest trap and not realize how much time you’ve spent there! 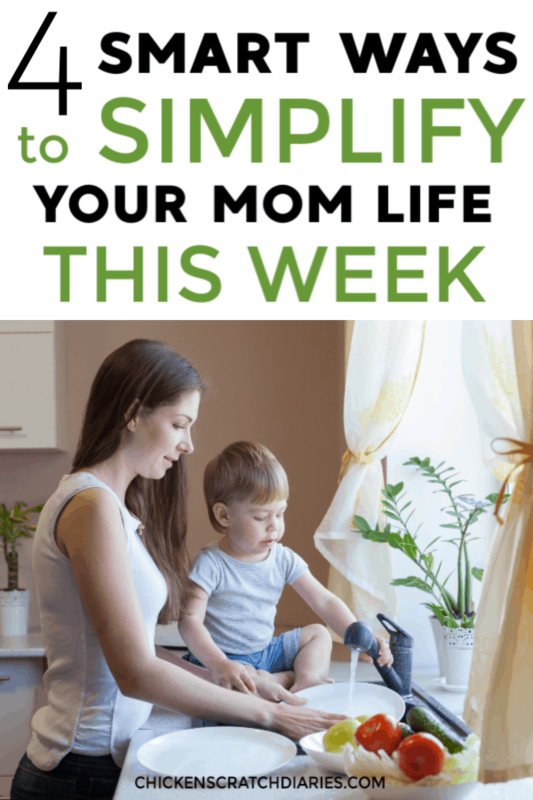 What are your best tips for simplifying your mom life? Tell us in the comments below! These are great tips! I love the bills written in the monthly calendar portion. Can’t wait to implement these! #4 is such a good suggestion! I implement this strategy as a blogger but I think that our world would have more interaction if we didn’t use social media as a mindless distraction. Especially when we are around others. I do worry that we’re raising a generation (as a whole) that won’t be able to have conversations with other people. There’s a lot of downsides to social media for sure and it’s something I’m trying to be more intentional about managing. Thanks for stopping by Lauren!